According to the World Health Organization (WHO), obesity is characterized by “an abnormal or excessive accumulation of body fat that can affect health”. Basically, obesity results from excessive consumption of calories relative to energy expenditure for several years. Obesity must be distinguished from overweight, which is also overweight, but less important. For its part, morbid obesity is a very advanced form of obesity. It would be so damaging to health that she would lose 8 to 10 years in life. We cannot rely solely on a person’s weight to determine if they are obese or overweight. Different measures are used to provide additional information and to predict the impact of obesity on health. Body mass index (BMI). According to WHO, it is the most useful, although approximate, tool for measuring overweight and obesity in an adult population. This index is calculated by dividing the weight (kg) by the size squared (m 2). Overweight or overweight is 25 to 29.9; obesity when he equals or exceeds 30; and morbidly obese if it equals or exceeds 40. The healthy weight corresponds to a BMI between 18.5 and 25. – The main disadvantage of this measurement tool is that it gives no information on the distribution of fat reserves. However, when fat is concentrated mainly in the belly region, the risk of diabetes and cardiovascular disease is higher than if it concentrates in the hips and thighs, for example. The waistline. Often used in addition to BMI, it can detect excess fat in the abdomen. There is talk of abdominal obesity when waist circumference exceeds 88 cm (34.5 inches) for women and 102 cm (40 inches) for men. In this case, the health risks (diabetes , hypertension , dyslipidemia, cardiovascular diseases , etc.) are considerably increased. Click here to find out how to measure your waistline . The waist / hips ratio. This measure gives an even more accurate idea of ​​the distribution of fat in the body. The ratio is considered high when the result is greater than 1 in men, and greater than 0.85 in women. Researchers are working to develop new tools for measuring excess fat. One of them, called fat mass index or IMA, is based on the measurement of the hip circumference and the size. However, it has not yet been proven and is therefore not used in medicine at the moment. To assess the existence of disease risk factors, a blood test (especially the lipid profile) gives valuable information to the doctor. The proportion of obese people has increased over the last 30 years. According to the World Health Organization (WHO), the prevalence of obesity has reached epidemic proportions globally. The increase in average weight is observed in all age groups, in all socio-economic groups. In France, nearly 15% of the adult population is obese, and about a third are overweight . When we try to understand why obesity is so widespread, we find that the causes are multiple and do not rely solely on the individual. Government, municipalities, schools, agribusiness, etc. also bear some responsibility for creating obesogenic environments. Environment not conducive to active transportation (walking, cycling). This obesogenic environment has become the norm in many industrialized countries and is found in developing countries as the population adopts a western lifestyle. People whose genetic makeup makes weight gain easier are more likely to be victims of the obesogenic environment. However, susceptibility to genes cannot lead to obesity alone. For example, 80% of Arizona’s Pima Indians today suffer from obesity. However, when they followed a traditional way of life, obesity was much rarer. 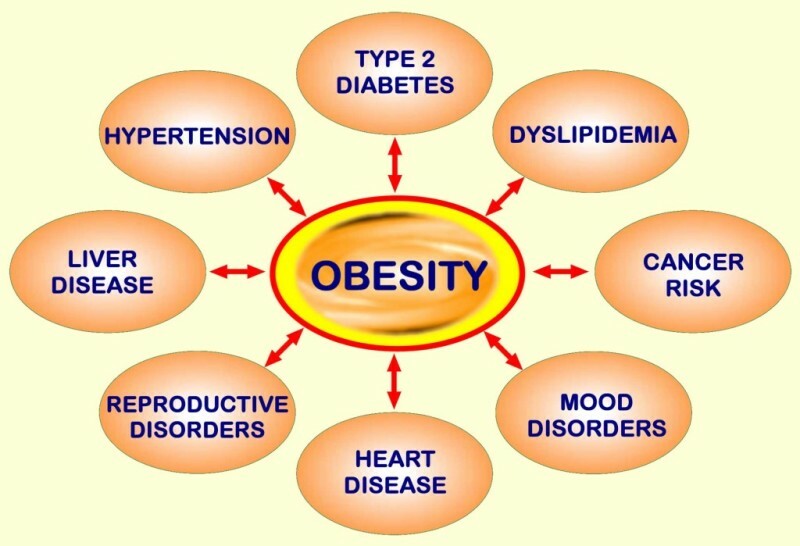 Obesity can increase the risk of many chronic diseases. Health problems would begin to appear after about 10 years of being overweight. Dementia, low back pain , phlebitis and gastro-esophageal reflux . The way in which the fat is distributed over the body, rather to the abdomen or the hips, plays a determining role in the appearance of diseases. The accumulation of fat in the abdomen, typical of android obesity, is much more risky than the more uniform distribution (gynoid obesity). Men have, on average, twice as much abdominal fat as premenopausal women. Of concern, some of these chronic diseases, such as type 2 diabetes , now occur in adolescence, given the growing number of overweight and obese youth. Obese people have a poorer quality of life by age and a life expectancy shorter than people who have a healthy weight. In fact, health professionals predict that today’s youth will be the first generation of children whose life expectancy will not exceed that of their parents, mainly because of the increasing frequency of obesity. Infant. Finally, obesity can become a psychological burden. Some people will feel excluded from society because of the beauty criteria offered by the fashion industry and the media. Faced with the difficulty of losing their excess weight, others will experience great distress or anxiety , which can lead to depression . At the hips, thighs and periphery, called gynoid, peripheral or subcutaneous obesity. For hormonal reasons, android obesity affects mostly men; and gynoid obesity, women. People whose hereditary baggage predisposes to obesity. Obesity depends mainly on environmental factors (palatables with high energy density, sedentary lifestyle, stress), but also genetic factors. The obesogenic environment we live in is particularly harmful for people who are genetically predisposed to obesity. Predisposition to obesity is dependent on more than one gene (polygenic obesity), with monogenic (single-gene dependent) forms of obesity being rare (approximately 5% of severe obesity). The combination of an obesogenic environment and a genetic predisposition is likely to lead to the development of obesity. The pregnancy may contribute to weight gain. Drinking alcohol frequently can lead to weight gain by increasing caloric intake and stimulating hunger (hence alcoholic drinks as an appetizer, to open the appetite). The loss of sense of security in neighborhoods, resulting in children playing less outdoors, using little walking or cycling to get to school, etc. The prevention of obesity can begin, as it were, as soon as one begins to eat. According to the studies, the risk of obesity is closely related to eating behavior during childhood. Already, from 7 months to 11 months, American infants would consume 20% too many calories compared to their needs. A third of American children less than 2 years do not eat fruits and vegetables, and among those who consume, fries come top of the list. As for Quebecers aged 4, they do not eat enough fruits and vegetables, dairy products and meat and alternatives, according to the Quebec Institute of Statistics. Consuming slimming products and dieting under strict diets without changing your eating habits is certainly not a good solution. Healthy eating should be varied and include fresh fruits and vegetables. Eating well involves cooking one’s own meals, replacing certain ingredients, flavoring foods with herbs and spices, taming new cooking methods to use less fat, and so on. Check our Nutrition factsheet for the basics of healthy eating. Gradually, introduce your child to new flavors. Physical activity is an essential part of maintaining a healthy weight. Moving increases muscle mass, therefore energy needs. Encourage the children to move, and move with them. Limit TV time as needed. A good way to be more active everyday is to frequent the small businesses in your neighborhood by walking. Reducing the sources of stress or finding tools to better manage them can make it less likely to calm down with food. In addition, stress often makes eating faster and more necessary. Check out our Stress and Anxiety chart to find out more about ways to better cope with stress. More and more experts say that the main goal of treatment should be to adopt better lifestyle habits. Thus, present and future health is improved. The resulting weight loss should rather be considered a “side effect”. The most effective approach to improving one’s long-term health is personalized, multidisciplinary and requires regular monitoring. The therapeutic approach should ideally include the services of the following professionals: a physician, a dietitian, a kinesiologist and a psychologist. One must begin with a checkup established by a doctor. This is followed by consultations with other health professionals. It is better to bet on a follow-up spread over several years, even during the phase of maintenance of the weight. Unfortunately, few clinics offer such support. According to experts at the Mayo Clinic in the United States, a weight loss of 5% to 10% of body weight can improve health significantly. For example, for a person weighing 90 kilos, or 200 pounds (and being obese based on his body mass index), this corresponds to a weight loss of 4 to 10 kilograms (10 to 20 pounds). Long-term weight gain: The dietary restriction imposed by diets is often untenable and generates intense physical and psychological stress. In a state of deprivation, the appetiteincreases and the expenditure of energy decreases. After analyzing 31 studies conducted in the United States and Europe, researchers observed that there could be a loss in weight of the first 6 months of a diet. However, 2 to 5 years later, up to two-thirds of people recovered all the lost pounds and even gained a few more. Dietary imbalances: according to a report published by the National Agency for Health Security of France, dieting without the advice of a specialist can lead to nutrient deficiencies or excessive excesses. Experts have studied the effect of the 15 popular diets (including Atkins, Weight Watchers and Montignac). With the help of a dietician-nutritionist, it’s about finding a nutritional approach that suits our own tastes and lifestyle, and learning to decipher our eating behaviors. Increasing energy expenditure helps a lot in weight loss and improves general health. It is safer to consult a kinesiologist before starting a physical activity. Together, you will be able to choose a training program appropriate to your physical condition and your interests. Consult a psychologist or psychotherapist can help to understand the origin of excess weight, changing some eating habits, to better cope with stress and regain their self-esteem, etc. Consult our page Psychotherapy. Some prescription medications can help you lose weight. They are reserved for people with significant risk factors for cardiovascular disease, diabetes, hypertension, etc. These drugs cause modest weight loss (2.6 kg to 4.8 kg). We must continue to take them for the effect to remain. In addition, they must be associated with a strict diet and have several contraindications. Orlistat (Xenical). The effect is a reduction in dietary fat absorption of about 30%. Undigested fat is excreted in the stool. It must be accompanied by a low fat diet to avoid or reduce adverse effects. Common side effects: oily and oily stools, urge to bowel, flatulence, abdominal pain. Note. In the United States and Europe, orlistat is also available over-the-counter at half the dosage, under the trade name Alli (in France, the drug is kept behind the counter of the pharmacist). The drug Alli is for overweight people. It is likely to cause the same types of side effects as Xenical. It must also be accompanied by a low fat diet. Contraindications apply. It is recommended that you consult a physician before starting treatment with this medicine to obtain a checkup and a comprehensive approach to weight control. Note that Meridia (sibutramine), an appetite suppressant, is no longer on the Canadian market since October 2010. This is a voluntary withdrawal by the manufacturer, following discussions with Health Canada . This medicine increases the risk of myocardial infarction and stroke in some people. The bariatric surgery is usually to reduce the size of the stomach, which reduces the intake of food by about 40%. It is reserved for people who are morbidly obese, that is to say, those with a body mass index over 40, and those with a BMI greater than 35 who have a disease related to obesity. Note. Liposuction is a cosmetic surgery and should not be used to lose weight, according to experts at the Mayo Clinic in the United States.